An easy and delicious cheese plate appetizer is perfect for a party, holiday entertaining, and any get-togethers! 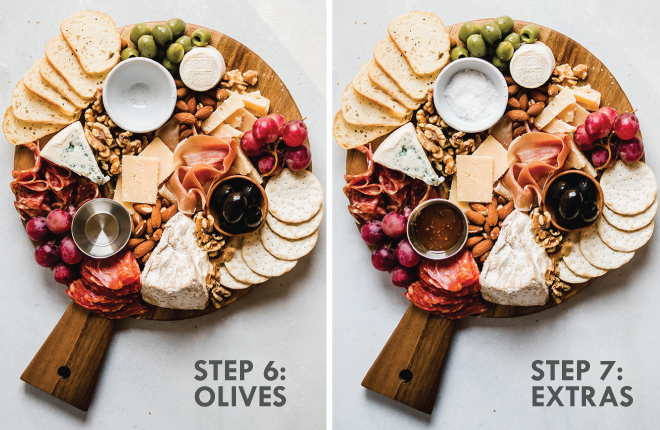 In this step-by-step tutorial, I’ll show you how to make a killer cheese plate every time. This post contains affiliate links: if you buy something I’ll earn a small commission at no cost to you. A cheese plate appetizer is an essential dish at 99% of my gatherings, holiday or otherwise. (It’s also been an essential dish on, y’know, Tuesdays when I’m too lazy to cook dinner). 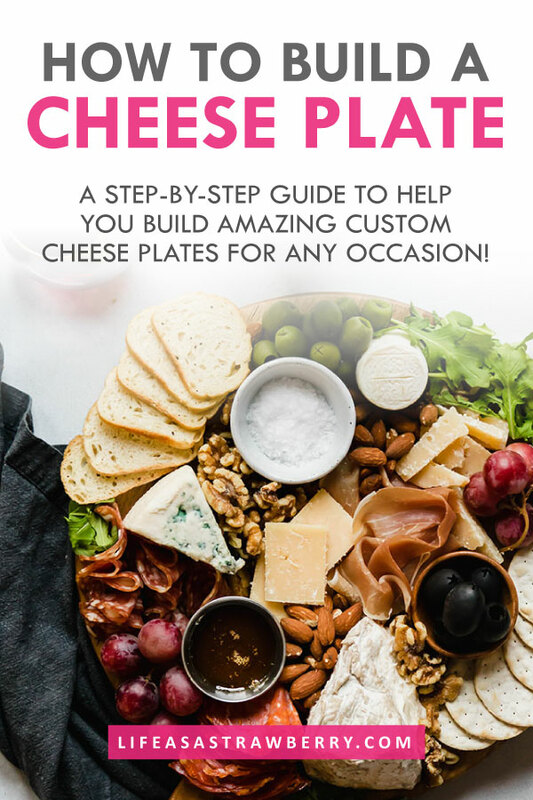 I’ll cover things like building seasonal cheese plates, what to include on your cheese plate, and how to make a cheap cheese plate (because BUDGET) later on – but let’s start with the ASSEMBLY. Cheese plates can look very proper and fancy, but I’m going to let you in on a secret: It is SO. EASY. 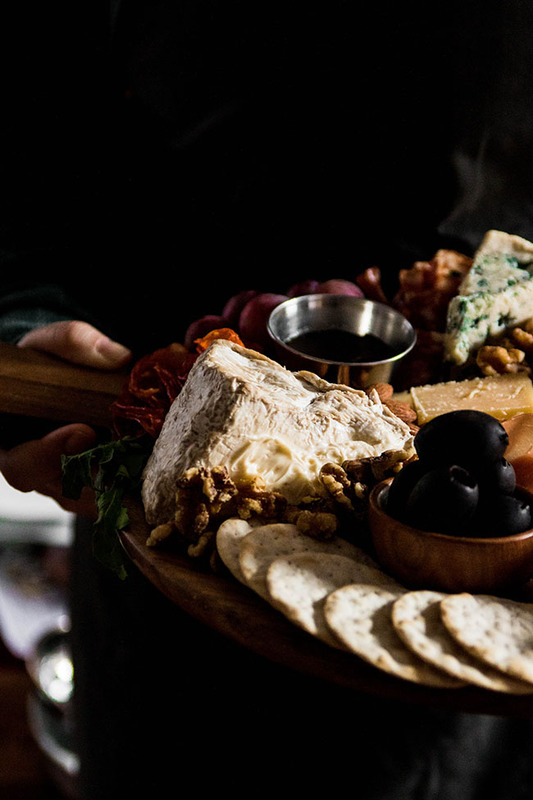 to build a fancy cheese plate – you just need to follow this basic order of operations. 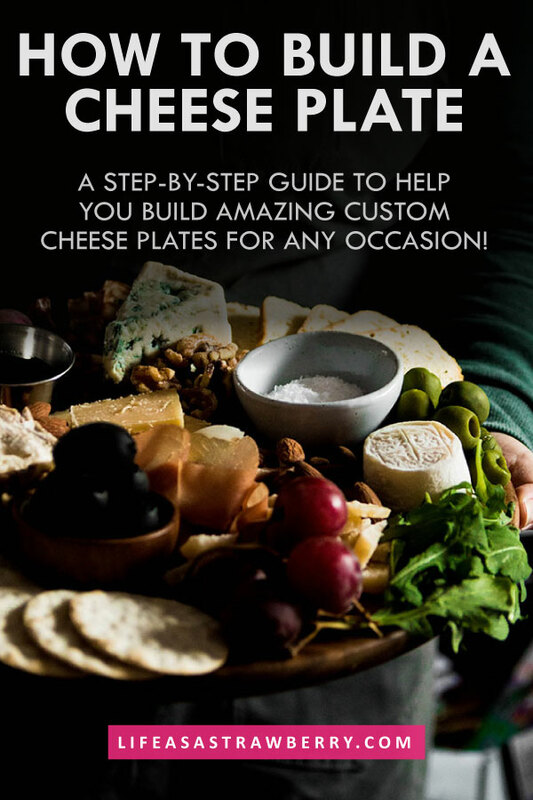 Don’t be afraid to get creative and have fun with it – you’re already on your way to making a perfect cheese plate every time! 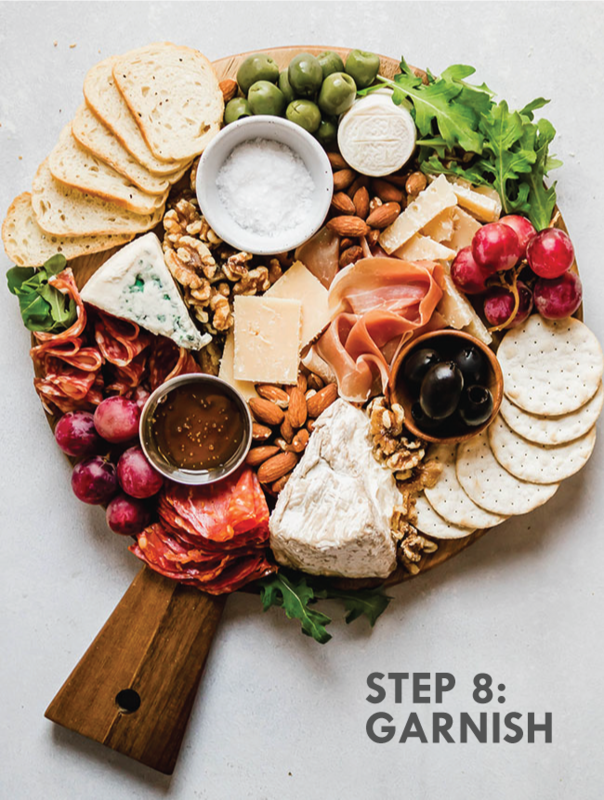 How to make a cheese plate step-by-step! 1. Start with the big items: bowls and cheese. 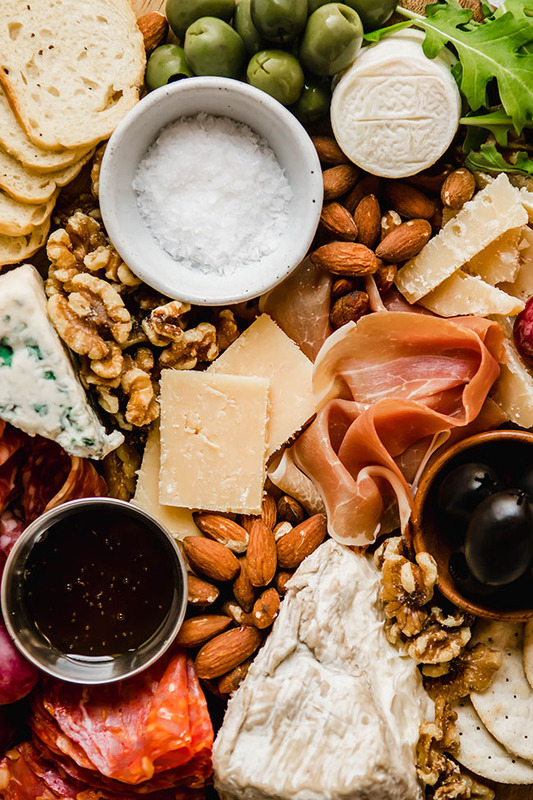 Start with the things that take up the most room on a cheese plate – you’ll tuck everything else into the blank spaces later on! Next, add the cheeses. Cheese should really be served at room temperature, which means you should take it out of the fridge and let it rest for 30 minutes to an hour before serving (learn more in this post). You can do this two ways: One, take the cheeses out of the fridge, throw them on the counter, and come back later to add them to the cheese plate. Or two, unwrap and cut the cheeses straight out of the fridge, then place them on the cheese plate and let them come to temperature on the board (pro tip: cover the cheese with beeswax wrap or plastic wrap to prevent them from drying out). I like to serve cheeses in a variety of shapes to add visual interest. Soft cheeses, like the brie and goat cheese in this photo, can be served as is. For hard cheeses, like the cheddar and parmesan, I prefer to cut them into slices and stack the slices up on the board – this makes it easier for guests to grab a piece without having to saw through a hard cheese with a cheese knife and makes the cheese plate more interesting. 2. Add meats, bread, and crackers. Next, add charcuterie to your cheese plate! I used soppressata, a basic deli salami, and prosciutto here. You can add your meats a few different ways: In a simple stack (saves time if you’re in a rush), fanned out in a line or half-circle (works best on large boards since this takes up more space) or by folding larger pieces into fun shapes (takes up less space and adds some visual interest). For this cheese plate, I opted to fold our charcuterie pieces to help them take up less space since we had a lot to get onto the board. Fold large, thin, circular pieces in half, and then roll them to form a small cone. Tuck the points of the cones tight in between a cheese and a bowl to keep them in place (you may have to re-tuck some of the cone ends as you add more pieces!). This is the technique we used for the deli salami on the far left side of the cheese plate. 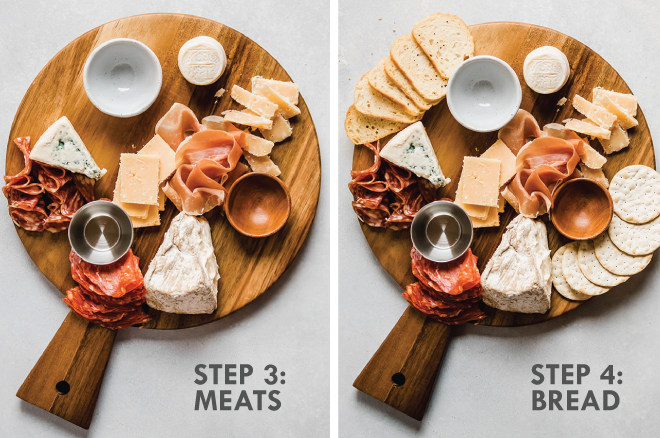 For thinner meats like prosciutto, simply hold each piece vertically above the cheese tray, then gently lower it down, twisting your hand a little bit as you go to help it develop some folds and stay in a small space. This is the technique we used for the prosciutto, slightly right of center on this cheese plate. If you’re using sausage, cut the sausage on a bias and fan the pieces out in a row. Next, the bread! Because I want to devote as much real estate as possible to the cheese, I put just a handful of of crostini or crackers on the plate and set out a bowl full of extra crackers for those who want them. Fan out crackers or crostini along the edges of the cheese plate to make them easy to grab. 3. Fill in big spaces with fruit and nuts. Next, add nuts! We used walnuts and almonds here. Drop a few nuts into the smaller blank spaces on the middle of your board to add some texture and cover any open spots. Leave a few spaces around the edges for olives or any extras you’re adding! 4. Add some olives and fill any small bowls. If you’re using olives, add them now! You can place them anywhere you’d like; to assemble this cheese board, I opted for some green olives on the board itself and some black olives in one of our small bowls. We have a love-hate relationship with olives in my house, so I include them on cheese plates about half the time. 5. Tuck some greenery into any space that’s still empty. YOU’RE ALMOST DONE! At this point, you have alllllllll the good stuff ready to go and have assembled a great cheese plate (WOOT). All that’s left is to fill in any remaining teeny gaps to make your cheese board look full and inviting. I ALWAYS opt to fill any last little spaces with something green. I find it helps break up the color since cheese plates tend to lean very red/white/brown. For this cheese plate, we chose fresh arugula, but you could also use fresh herbs (I love adding rosemary sprigs to a cheese plate!) Arugula is my go-to because it’s almost always in my fridge, and the leaves are small and flexible enough that I can really tuck them into small spaces (plus, a crostini + brie + arugula + walnuts + a grape + honey = THE BEST BITE EVER). TA-DAAAAAA! See what I mean? YOU CAN TOTALLY DO THIS. For best results, let’s talk through some essential tips and techniques to help you make a beautiful cheese plate! 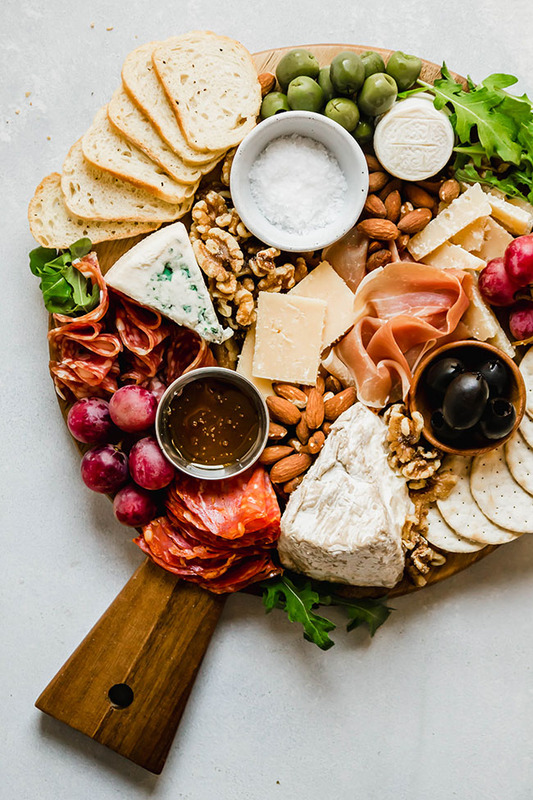 There are SO many choices when it comes to building your cheese plate – and there’s really no right or wrong way to do it! I’ll outline my basic guidelines below (including how many varieties from each category to include) and some ingredient lists for inspiration, but don’t be afraid to make it your own! Variety is your friend when it comes to cheese! Choose a mix of soft and hard cheeses, flavors, and milk types (cow, goat, or sheep’s milk cheese). 1 exciting flavor (like an extra-tangy goat cheese or an off-the-wall flavor like ash ripened cheese, flavor-infused cheese, or whatever grabs my eye at the store! Now, TECHNICALLY, we could break cheeses out into a bunch of categories: Hard, semi-hard, semi-soft, soft, etc. Those distinctions can be useful, but in the case of cheese plate building, I find it’s easier to think about cheeses in just two groups: HARD (cheeses that you need a sharp knife to cut easily & that you’ll likely cut before putting them on the cheese plate) and SOFT (cheeses that are often somewhat spread-able and easy to cut with a butter knife or cheese spreader). Goat cheese (I love a basic log or every single one of the aged goat cheeses from Vermont Creamery). My best advice for choosing cheeses, though? Make friends with the people at your grocery store cheese counter! We haven’t always lived by a store with a great cheese selection, but the last few years we’ve been lucky to live by a Wegmans with allllllll the cheese you could ever dream of. My strategy is to grab a few cheeses I KNOW I want to include – usually a sharp white cheddar and a good goat cheese – and then pop by the cheese counter and ask them what’s new and delicious (if I still need an out-of-the-box cheese for my cheese board, I ask them to show me something totally wild. They always deliver). But enough about cheese! (JK we all know we can never talk enough about cheese) Let’s talk accompaniments! 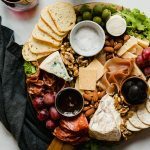 This is a short(ish) list, because this post is getting loooooooong – refer to the how-to instructions and the seasonal cheese plate lists for more ideas and suggestions! PS – For a more in-depth list of charcuterie options, check out this post! If you’re serving a cheese plate as an appetizer, plan to have 2-3 oz. of cheese per person. If you’re serving a lot of accompaniments (like charcuterie, crackers, and fruit) alongside the cheese, people will eat a little less cheese. Fewer accompaniments? Plan for people to eat a little more. If you’re making a cheese plate for dinner (*raises own hand*) plan for 4-5 oz. of cheese per person and load that plate up with plenty of fruits and veggies (because, y’know, BALANCE). And here’s the thing: If you or your party guests aren’t big cheese eaters, you don’t need as much cheese. If you’re hosting a contingent of CHEESE. PEOPLE., you might want to stock up. If you’re worried you have too much cheese, cut all of your cheeses in half and put out one half at a time – you can always take the rest out later if you need it! Having a little extra cheese in the fridge for later is never a bad thing. Worried you don’t have enough? 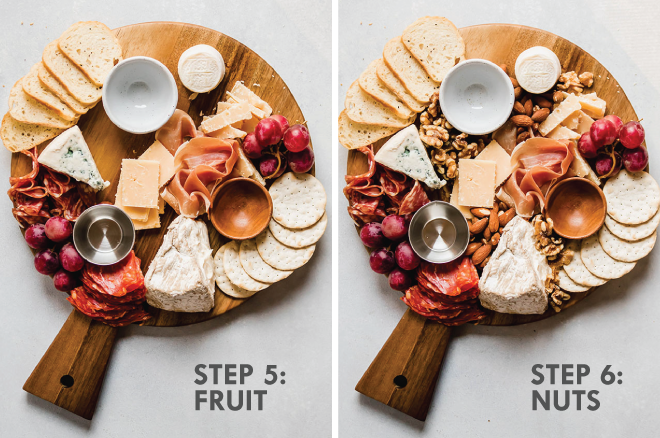 Cut hard cheeses into extra-small pieces, spread each cheese out over a few different spots on the cheese board, and add plenty of extra fruit, nuts, and crackers. (For reference, the cheese plate we made for these photos served about 10 people as an appetizer. We put out some extra crackers, crostini, and charcuterie halfway through, but we ended up with just the right amount of cheese). Cheese is DELICIOUS, but it can also get EXPENSIVE. Here are a few wallet-friendly shortcuts I like to take when I’m building a cheese plate on a budget. Pare down the number of items on the plate. It’s definitely FUN to have five different cheeses on a plate, but it’s not NECESSARY. If you’re on a budget, choose just one or two cheeses. Cut them into pieces and put each cheese in multiple places on the board so that it still looks full and delicious! Skip the fancy stuff. You don’t need a bunch of super-fancy (read: EXPENSIVE) cheeses on your plate for it to be a hit. There are plenty of cheeses that taste great and won’t break the bank. Aldi has a great, budget-friendly selection, and Vermont Creamery makes amazing goat cheeses at low price points. Get the cheap crackers. If you’re going to spend money on anything for a cheese plate, it should be the cheese. Don’t worry about $4-a-box packs of 20 crackers if you’re on a budget – grab some Ritz or Wheat Thins and call it a day. (I promise no one will mind!) If you can find a cheap baguette at your grocery store (we can usually get them for $2-$4) grab one of those and slice it into thin pieces to stretch it out. Skip the nuts. Nuts can get pricey. Around here, peanuts tend to be the cheapest variety to buy, but shave some money off your bill by skipping the nuts altogether and filling those spaces with extra arugula or in-season fruit. Shop in season. It’s almost always cheaper to buy fruits and veggies when they’re in season! Go light on the charcuterie, or skip it altogether. Aside from cheese, meat can be one of the most expensive parts of a cheese and charcuterie plate. If I’m on a budget but want some extra protein, I’ll hit the deli counter and get some simple deli salami and sliced ham or turkey. I’m also usually happy to skip the meat entirely and add some extra fruit or crackers to round out the plate. Use a large, flat board. You don’t need anything fancy – a cutting board will do! You just want to make sure it’s big enough to fit everything comfortably. For these photos, we used a circular wooden cutting board (similar one here) but I also frequently make cheese plates on large plastic cutting boards, serving platters, or even spread out across a few dinner plates. You definitely don’t need to run out and buy something brand new just for cheese boards. You’re going to cover your board up anyway, so don’t worry if it doesn’t look perfect! Set out your cutting board/plate and arrange any small bowls the night before. You can also set out any containers of nuts, salt, or honey you’re planning to use so they’re ready to go. 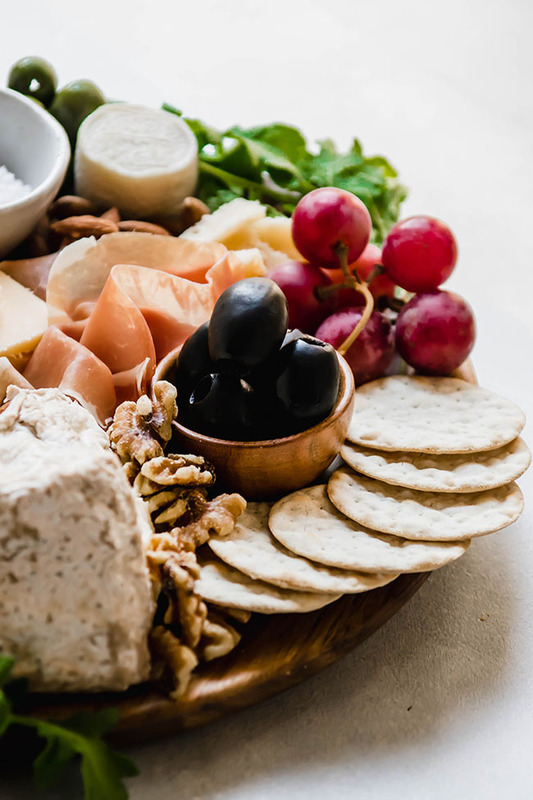 Assemble the cheese plate a few hours early, cover with reusable beeswax wrap or plastic wrap, and stick it back in the fridge (just make sure to take it out at least half an hour before you need it so the cheese can come to room temperature!) If you do this, I recommend adding any nuts or greenery at the last minute to preserve texture. Cut any hard cheeses ahead of time and store them in a container in the fridge until you’re ready to use them (I like wrapping cut cheese in beeswax wrap or throwing it in a glass storage container). Keep your cheese plate fresh. If I know a cheese plate will be sitting out for awhile, I like to put the cheese out in waves. If I have one board, I’ll put half the ingredients out at first, and then replenish after an hour or so. I’ll also sometimes make two smaller, identical cheese boards, and keep the second one in the fridge until the first one is close to running out. It’s also easy to toss some more crackers or nuts onto a cheese plate, so don’t worry about putting every single thing out at once! 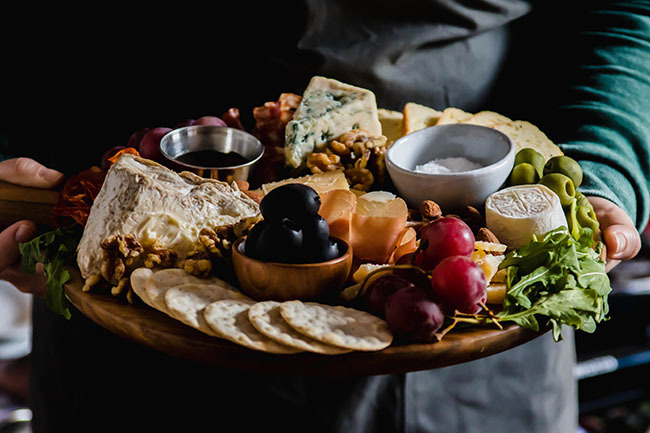 If I have a bunch of guests over (like at Thanksgiving or Christmas) I’ll even assign someone the job of “cheese plate replenisher” and show them where everything is so they can add to the cheese plate if it starts running low. You do you. At the end of the day, it’s your cheese plate – and it should look and taste the way YOU want it to! 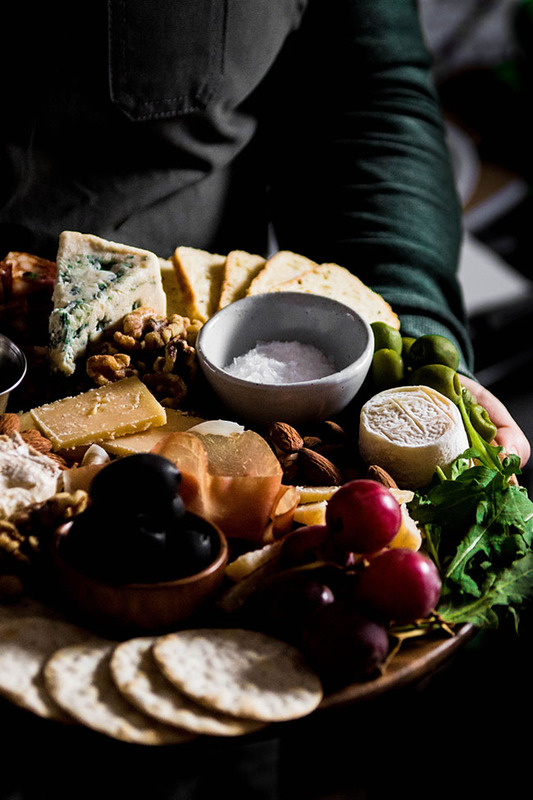 I love building super-duper full cheese plates (like the one in these photos) because they’re more fun to look at. If you’d like a little more room to maneuver, though, feel free to space out the cheeses and accompaniments to leave more space between each item! There’s also no shame in throwing the guidelines out the window and sticking to your tried-and-true favorites (I’ve been known to make the occasional all-goat-cheese cheese plate. You gotta do what you gotta do). 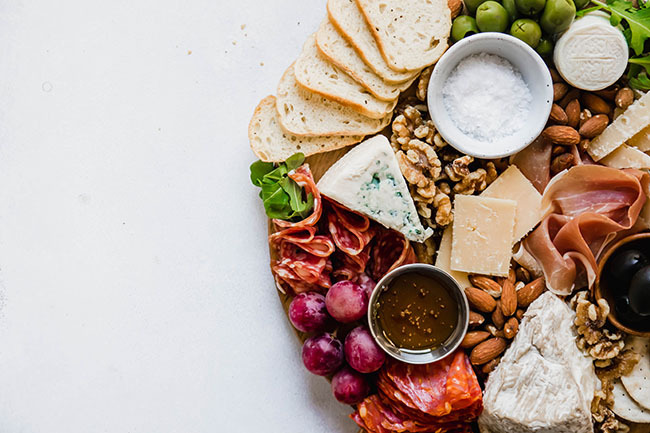 All the ingredients you need to build the ultimate cheese plate appetizer. 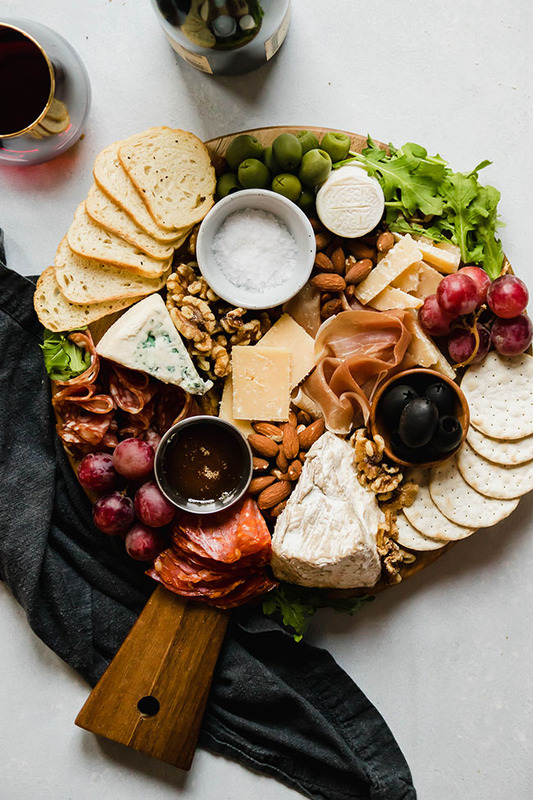 Use this list as a general guide – these are the ingredients we used to build this exact cheese plate, but don’t be afraid to mix it up using your favorite snacks and cheeses or anything you have on hand! Follow the step-by-step photos in this post to assemble all ingredients on a large cutting board or platter. Enjoy! Thanks for writing this awesome tutorial. It was exactly what I needed. Oddly enough, I just ordered an ash aged soft cheese from Vermont creamery for Easter dinner. It was served on a restaurant cheese plate and I had to have more. Hi Jessie, I just learned of your blog from the Winester Review. Great pointers for the cheese platter! I will pop by again! 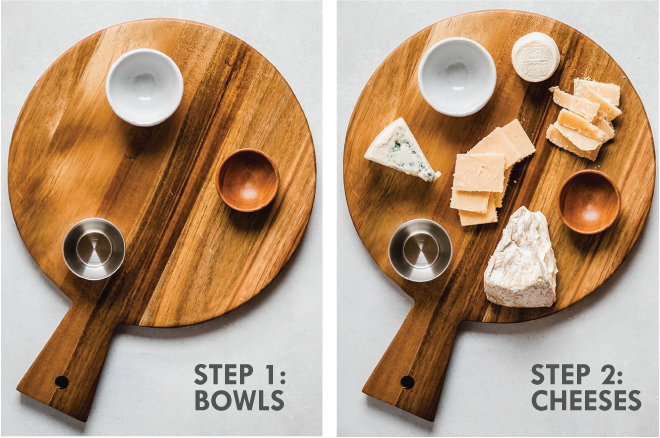 This is the best instructional on making a cheeseboard, so simple! I’m love and I’m so happy I stumbled across you blog! 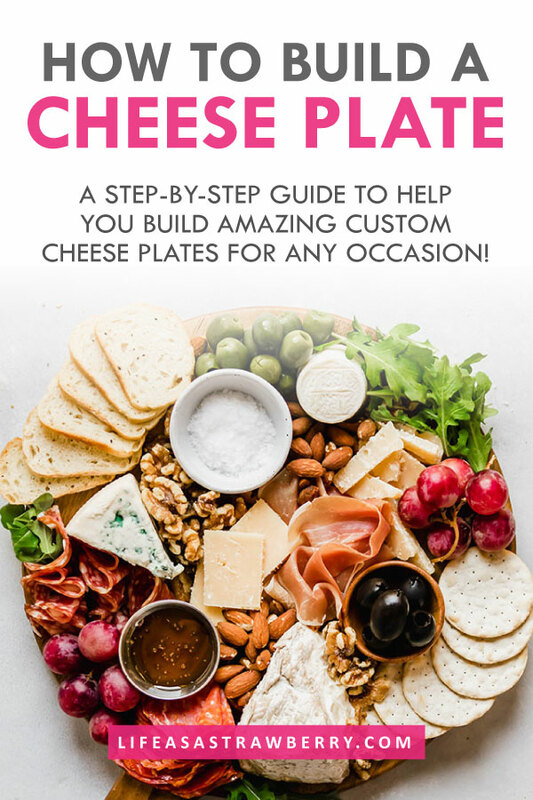 I’ve read a TON of blogs about creating cheese plates (i have a cheese plate obsession) and this is by far the best, most helpful and in depth one I’ve read yet. Thank you! Hi Christine, thank you! Glad it was helpful.